Removing your major appliances and electronics from you home can be a tedious chore, but if you’re purchasing new ones, you’ll probably not want the old ones cluttering your home. If you have a dryer, stove, microwave or dishwasher or other major appliance or electronic item, they should be disposed of in a manner that is environmentally friendly. Every attempt should be made not to contribute to the commercial and residential waste that goes unchecked in your community. As a removal company, Centennial Junk Removal practices responsible appliance removal and electronics recycling, ensuring these items will be recycled. In an age of modern electronics in which new models of equipment are released on a routine basis that almost seems as if it’s daily, we have generated a great deal of electronic waste. New electronics make our lives more convenient but the older models remain, and unless you have a disposal plan they become a hazard to the environment. Electronic waste includes devices like mobile phones, laptops and monitors, audio and visual equipment like VCRs and DVD players as well as fax machines. These are all examples of devices that generate a great deal of waste, and some experts report that as many as approximately 50,000 to 60,000 computer monitors are disposed of each year. Recycling these objects ensures that materials they are made with are properly disposed of. Most major appliances and electronics are made with a great deal of materials that can harm our environment if not properly disposed, and if simply dumped without recycling they can also cause health problems. Materials such as lead, if left at dump sites, will eventually be released into the air and into the ground, and anyone who is living nearby these dumping grounds can be seriously affected. Centennial Junk Removal aims to prevent this by removing appliances and electronics from your property and properly disposing of them. We are a responsible and experienced junk hauling company in Centennial, CO and the Denver area that is available to pick up your appliances no matter how big or small they are. Buying new appliances and electronics bring better convenience into our homes and improves our quality of life, but when you want to get rid of older equipment, it can be tough to figure locations that will allow you to dump them, so hiring a professional to remove these things from your property can prove a great relief and lift the burden from your shoulders. 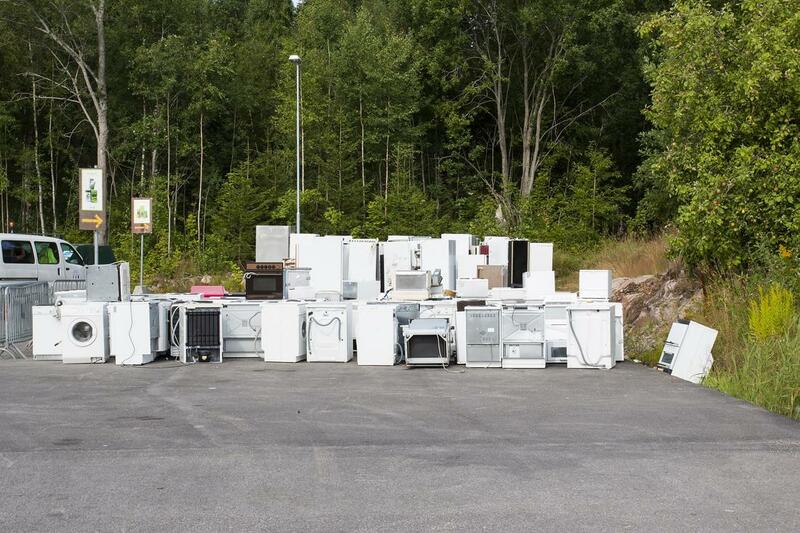 No matter how heavy the appliances and electronics, we can haul them away quickly and efficiently and dispose of them responsibly so that you’re not spending hours researching appropriate locations or making tons of phone calls to find someone willing to lift and haul them away. We are a professional junk removal company that has been conducting removals for years in the Denver area. As a leading company, we offer customers fair and affordable prices for removing appliances and electronics from their property. We are known for cheap junk removal prices for everything from refrigerator removal and recycling and stove removal and recycling to washing machine, water heaters and office printers.